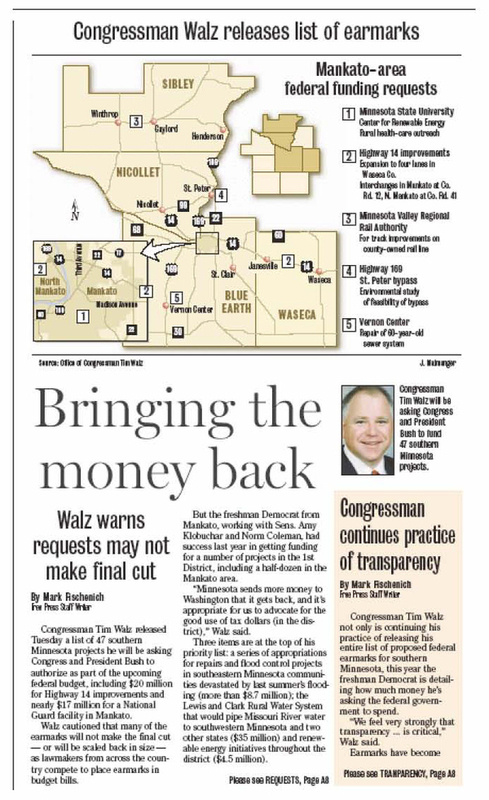 Newspapers across the district are reporting on Walz's release yesterday of his budget requests--and the preliminary dollar amounts attached to them. About fifty percent of the dollar amounts are for three large multi-state public works project that enjoy broad bipartisan support from the congressional delegations in the states where the projects are located. The three alrge projects are the Lewis and Clark Rural Water Project (MN, IA, SD); the Upper Mississippi River Navigation project that would update the lock and dam system for barge traffic (upper Mississippi and Illinois Waterway); and the Upper Mississippi River Restoration (MN, IA, IL, WI, MO). Rep. Tim Walz, D-Minn., on Tuesday released his list of funding requests — also known as earmarks — before the House appropriations process begins for fiscal year 2009. Walz requested 55 earmarks for projects throughout the 1st Congressional District — though he emphasized most won’t receive funding. The requests are winnowed in committees before they’re scrutinized by the full U.S. House, then the Senate, then the president. Depending on the outcome of that process, the Winona area could benefit from a host of requests to fund flood-prevention efforts. . . .
Are efforts to provide better flood prevention in Southeastern Minnesota wasteful spending, or a sound investment? What are citizens and taxpayers shelling out after last August's floods? 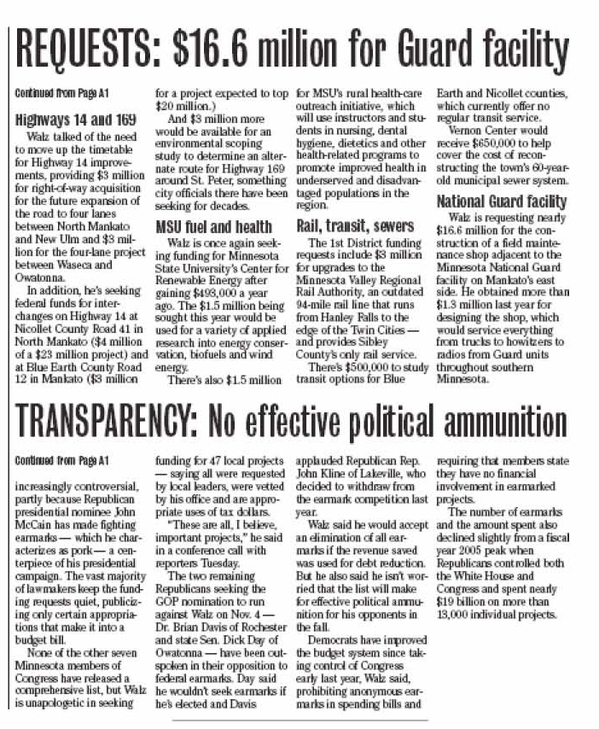 Congressman Tim Walz released Tuesday a list of 47 southern Minnesota projects he will be asking Congress and President Bush to authorize as part of the upcoming federal budget, including $20 million for Highway 14 improvements and nearly $17 million for a National Guard facility in Mankato. Walz cautioned that many of the earmarks will not make the final cut — or will be scaled back in size — as lawmakers from across the country compete to place earmarks in budget bills. But the freshman Democrat from Mankato, working with Sens. Amy Klobuchar and Norm Coleman, had success last year in getting funding for a number of projects in the 1st District, including a half-dozen in the Mankato area. “Minnesota sends more money to Washington that it gets back, and it’s appropriate for us to advocate for the good use of tax dollars (in the district),” Walz said. Rep. Tim Walz released the list of projects that he will be forwarding to the House Appropriations Committee for consideration. The 47 projects on his list carry a price tag of $211.5 million. However, Walz cautioned that few of the projects on his list may make it through the appropriations process and receive funding, at least for this year. Walz’s list didn’t originally include price tags for his projects, however, until reporters on a teleconference call asked him how his claim to bring “transparency” to the process squared with his reluctance to announce the dollar amounts he was putting on his requests. Walz pointed out that Minnesota’s other congress people don’t even announce their lists, as he does, but he agreed it would be proper to release the amounts of the projects on his list. The jpgs below provide the full articles from the Mankato Free Press. We hope you will read the articles; they note that the two candidates remaining in the Republican primary battle have said that they will not make budget requests, or earmarks, for the district.